In our time, life moves fast. Despite the demands of modern adults, we are the guilty ones for making bad decisions in our life, like eating junk food or not doing enough exercise. But perhaps the most damaging thing, however is not having a good rest. When you are asleep, your body performs important repairing functions, which means that a lack of sleep can lead to serious problems such as fatigue, loss of mental clarity and other health problems. Most of us are probably already aware of the importance of sleep, but did you know that the position during the sleep has a big impact on your health? People tend to sleep in four basic positions: on your right side, on your left side, on your back or in a fetal position. Each position has advantages and disadvantages, although most people tend to base their position on personal comfort. Sleeping on the left side however is the position whose benefits are promoted by both holistic medicine and Western medical science. 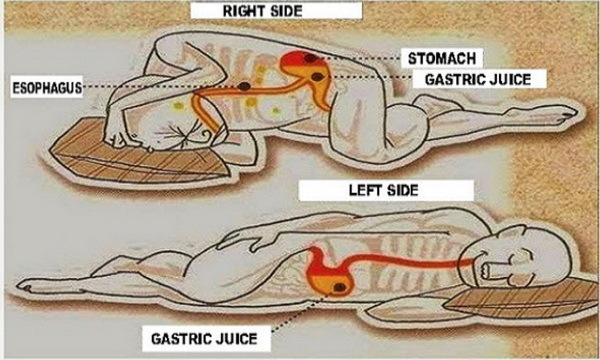 Take a look at the pictures below for eight health benefits when sleeping on your left side. Sleeping on the left side provides relief in the reflux of the heartburn. This is especially true after a very copious or spicy meal. If you are prone to sleep apnea and / or snoring in general, try sleeping on your left side. Your partner will thank you in the morning. Sleeping on your left side also works with gravity to help improve the digestion of food by encouraging progression into the intestinal tract. Sleeping on the left side can also provide additional drainage for the lymphatic system through gravity, avoiding some of the workload of your heart and improves the general health of the heart. Increased drainage thanks to gravity also helps your spleen, which is always something positive. The left side of the body is believed to be the dominant side of the lymphatic system (vital for the immune function). Sleeping on the left side promotes better filtration and drainage of the waste. Sleeping on the left side has been found to improve circulation, thanks to less pressure on the vena cava (the largest vein in the body), which is on the right side of our body.